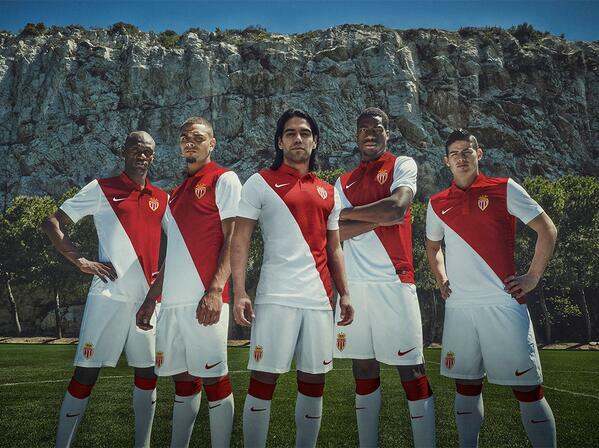 Monaco play their home games in red and white shirts with white shorts and red socks. The away colours are black shirts with white sleeves, white shorts and black socks. Although the club is in Monaco, it competes in the French football leagues. The Association Sportive de Monaco Football Club was founded in 1924 as an amateur team and became professional just after World War II in 1948. Monaco play their home games in the 18,500 seater Stade Louis on Avenue des Catelans in Monaco, which is also used for the European Super Cup matches each season. AS Monaco have been Ligue 1 champions on seven occasions and they famously made the 2004 UEFA Champions League Final in 2004 but lost to Portuguese club FC Porto. AS Monaco currently play in Ligue 1 where the club are most notably known for wearing red and white halved shirts which are manufactured by Nike. The away kit features two tones of blue with red trim. Currently managed by Leonardo Jardim the club have had several household names play for the club in recent times including Fabian Barthez, Thierry Henry, David Trezeguet, Yaya Toure, George Weah, Jurgen Klinsmann, Christian Vieri, Radamel Falcao, Youri Djorkaeff, James Rodriguez and Javier Saviola.